The 2012-13 NBA season had just come to an end and the Philadelphia 76ers were, by all accounts, once again mediocre. They finished the regular season fourth in the Atlantic Division with a 34-48 record, didn’t make the playoffs, and it’s fair to say that the Andrew Bynum trade didn’t exactly pan out. This was a team that, just the season before, had made it to the Eastern Conference Semifinals and now here they were, ninth in the conference and without any real direction. Could things get any worse? They most certainly could. Everything the Sixers are, and everything they may turn out to be, can be traced back to one moment: the hiring of Sam Hinkie. The former Houston Rockets executive vice president of basketball operations is a major proponent of using analytics to determine a player’s worth and, as the new president and general manager, he was about to bring that mindset to the 76ers. But this had now become a project. This franchise was not going to be fixed overnight. If Philadelphia wanted to keep making the playoffs, but not really contend, then they could’ve just stuck with what they were doing. The hiring of Hinkie was not a myopic move by any means. It was not about immediacy, it was about creating a perennial contender for the long haul. This was going to take time and, by bringing in Sam Hinkie, the 76ers’ brass showed that they supported this new direction. “I’m just trying to use information to make decisions,” said Hinkie. “I think some people move along quickly and others don’t. That’s OK.” The rebuilding process may have been slow by design, but that didn’t mean that Hinkie wasn’t going to immediately turn things upside down. This was when the new Sixers identity would be forged. At the 2013 NBA draft, Hinkie sent shockwaves through the rest of the league by trading All-Star guard Jrue Holiday to the New Orleans Pelicans for their No. 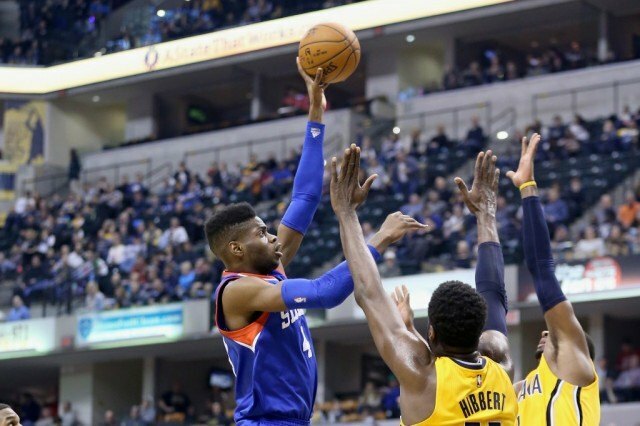 6 pick, former Kentucky center Nerlens Noel. It seemed like a risk to make this kind of deal. After all, Holiday was a proven talent who was starting to come into his own and Noel, despite his undeniable upside, was expected to miss the entire 2013-14 season after tearing his ACL. However, given the new mindset of the 76ers, this was exactly the kind of foundational piece that their rebuild needed. For all of his skill on the defensive end, Noel was extremely raw and unpolished offensively. Once again, Philadelphia would use time to their advantage. Philadelphia used their No. 11 pick on Syracuse point guard Michael Carter-Williams and it looked like Hinkie had found his replacement for Holiday. Carter-Williams was another player who needed time to refine his skills, but once again it was all about potential he brought to the table. And he certainly exceeded expectations during his rookie season in 2013-14, by averaging 16.7 points, 6.3 assists, 6.2 rebounds, and 1.9 steals a game. Despite the team finishing 19-63 on the year, the 6-foot-6 guard won Rookie of the Year by a landslide, and it looked like the Sixers had found themselves another major piece for their rebuilding puzzle. Could the next year be the year? Nope. In the 2014 NBA draft (the Sixers had two top-10 picks), Hinkie decided to use the No. 3 pick on injured Kansas center Joel Embiid. Once again, it was a pick that was not desired to have an immediate impact. Embiid’s ceiling was too high to pass up and if he returned to full strength, he had the potential to be the next great center. If you were an impatient Sixers fan, then this would not be the only controversial pick in the draft. Philadelphia used their No. 10 pick on point guard Elfrid Payton and then traded him to the Orlando Magic for their No. 12 pick. With that pick, the 76ers would take overseas prospect Dario Saric, a talented kid who wasn’t expected to play for a few years. Frustrated Philly fans would have to wait even longer to see their Sixers rise to prominence. But this trade was about more than just acquiring assets, it was about getting back a pick we lost in the Bynum deal. This is how Sam Hinkie operates, and it shouldn’t surprise anyone who recognizes how much he values picks. Which is why one shouldn’t have been that surprised that at the 2015 trade deadline, Philadelphia shipped Michael Carter-Williams to the Milwaukee Bucks in a deal that would nab them another first-round draft pick. Quite frankly, this is who the 76ers are right now, until the day they’re not. 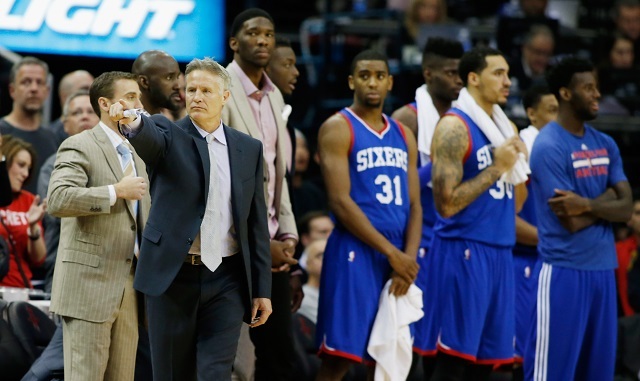 The 2014-15 Philadelphia 76ers are not a good basketball team. At present, they are 14-49, last in the NBA in most offensive categories, and well on their way to another top-three draft pick. But despite all the chatter that surrounds the notion of “tanking,” we’re not so sure that’s the best way to describe their mindset in Philadelphia. The Sixers are losing games, that much we can agree upon, but they are not just giving the games away. They’re playing hard and fighting the entire 48 minutes. Head coach Brett Brown is doing the best he can with the players at his disposal, Noel is evolving into the player many believed he could be, and Dario Saric is crushing it overseas. Also, have you seen highlights of Joel Embiid lately? We’re more than impressed with his recovery so far. We can’t help but be a little optimistic about the future of Philadelphia basketball. It’s been quite some time since we’ve seen an owner fully back a “lose now” philosophy, but that’s exactly what Josh Harris seems to be doing with Sam Hinkie. Anyone can just squeak into the playoffs, but it takes real guts to commit to a complete organizational overhaul. The goal isn’t necessarily to continue to get rid of good players for assets, it’s about putting yourself in position to get the best possible players around which to build a foundation. Teams in the NBA do not win championships unless they have superstars on their roster. The Sixers know this to be true, and are doing everything in their power to bring that caliber of player to Philadelphia. It may take some time for things to turn around for the 76ers, but if we’ve seen anything, it’s that they’re more than happy to wait.